Updated to show the number of questions tested on the 2017 Math STAAR (number of questions are show by asterisks). This is a list of all the 4th grade math TEKS that are historically tested on the STAAR. I print these on label paper and cut and put on a large teacher chart to keep track of testing data throughout the year. It can also be used for student data tracking. 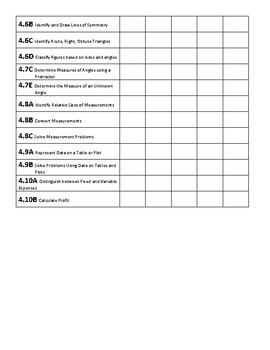 My students each have this document in a folder and keep track of how they scored on individual TEKS after each test (I print out student data broken down by TEKS). They are able to see how they have improved throughout the year and what TEKS they need to practice more. Great for STAAR review! 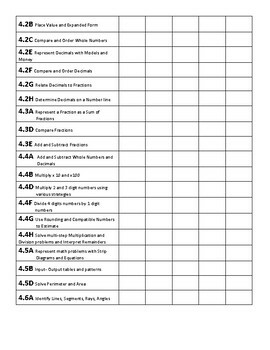 I also put a copy into student's tutoring folders, so they can check off what TEKS they have worked on or need to work on.